Secular Tunisians are expressing concerns after a leader of the country's Islamist Al-Nahda movement said Tunisia's emerging government marks "the Sixth Righteous Caliphate." The fifth caliphate, an Islamic imperial governing system, was abolished by Turkish secular Kemal Ataturk in 1924. In a speech posted on YouTube Sunday, Hamadi Jbeli also pledged that "we shall set forth with God's help to conquer Jerusalem, if Allah wills… From here is conquest with the help of Allah Almighty." Al-Nahda won 98 of 217 parliamentary seats in the nation's first free elections and Jbeli may be its candidate for prime minister. The group's electoral success won international praise as a "moderate" movement promoting a democratic form of political Islam. Headlines in mainstream media outlets like theNew York Times, Los Angeles Times, and CNN called Al-Nahda moderate. Jbeli's statements have many Tunisians questioning the label's validity. He spoke at a rally held by the group in celebration of its electoral success and leading role in forming a governing coalition. It is also not the first time the group has promoted moderation to outsiders while preaching different values to party members. Leading secularist party Ettakatol suspended its participation in committees to form a governing coalition. "We do not accept this statement," said Khemais Ksila, an executive committee member of Ettakatol. 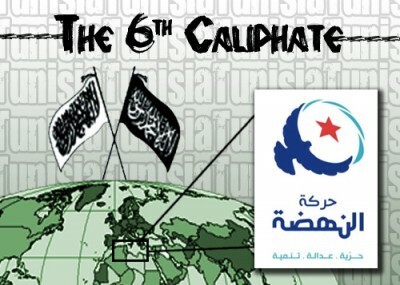 "We thought we were going to build a second republic with our partner, not a sixth caliphate." Issam Chelbi of the secular PDP party called the speech "very dangerous." "This is what we feared," Chelbi said. Tunisian women's groups also have been skeptical of Al-Nahda's moderation, saying there has been an increase in verbal and physical abuse since President Zine Abidine Ben Ali resigned in the wake of a popular uprising. Party leaders tried to contain the damage, telling Reuters that Jbeli was talking about "good governance and a break with corruption ... not the establishment of an Islamic regime." Although Al-Nahda's breach of Tunisian secularism dominated reports on the controversial political rally, including Reuters' article, speakers also promoted the military conquest of Israel. The event also marked the first time Al-Nahda invited a Hamas representative, Houda Naim of the Palestinian Legislative Council in Gaza, to address a political rally in Tunisia. Naim expressed hope that the liberation of Tunisia would lead to the "liberation of Palestine," which Hamas believes can only be achieved through violence or "resistance." Al-Nahda's secretary general echoed Naim's call, stating, "The liberation of Tunisia will, Allah willing, bring about the liberation of Jerusalem." Support for Hamas and the complete "liberation of Palestine" have been consistent messages from Al-Nahda's political leaders and its charter. Hamas has reciprocated with its support for Tunisia's revolt against dictatorship and embracing political Islam. The Arab Spring "will achieve positive results on the path to the Palestinian cause and threaten the extinction of Israel," Party leader and ideologue Rashid Ghannouchi said in a May interview with the Al Arab Qatari website. "The liberation of Palestine from Israeli occupation represents the biggest challenge facing the Umma [Muslim nation] and the Umma cannot have existence in light of the Israeli occupation." Further, in the same interview, Ghannouchi said: "I give you the good news that the Arab region will get rid of the bacillus [bacteria] of Israel. Sheikh Ahmed Yassin, the leader of Hamas, said that Israel will disappear by the year 2027. I say that this date may be too far away, and Israel may disappear before this." Ghannouchi has also given his support to specific types of terror carried out by Hamas, including rocket attacks against Israeli civilians and "martyrdom operations." "I would like to send my blessings to the mothers of those youth, those men who succeeded in creating a new balance of power…I bless the mothers who planted in the blessed land of Palestine the amazing seeds of these youths, who taught the international system and the Israel (sic) arrogance, supported by the US, an important lesson. The Palestinian woman, mother of the Shahids (martyrs), is a martyr herself, and she has created a new model of woman." Ghannouchi has even gone beyond rhetoric, calling for Muslims to fund and provide logistical support for Hamas. He signed the controversial "Istanbul Declaration," issued by Muslim clerics in support of Hamas after Israel's January 2009 war in Gaza. The declaration stated that there was an "obligation of the Islamic nation to open the crossings – all crossings – in and out of Palestine permanently" to provide supplies and weapons to Hamas to "perform the jihad in the way of Allah Almighty." Ghannouchi's statements are consistent with Al-Nahda's platform, which declares that the party "struggles to achieve the following goals … To struggle for the liberation of Palestine and consider it as a central mission and a duty required by the need to challenge the Zionist colonial attack. The platform also refers to Israel as an "alien entity planted in the heart of the homeland, which constitutes an obstacle to unity and reflects the image of the conflict between our civilization and its enemies." In September, the organization stated that it "supports the struggle of peoples seeking liberation and justice and encourages world peace and aims to promote cooperation and collaboration and unity especially among Arab and Islamic countries and considers the Palestinian struggle for liberation to be a central cause and stands against normalization." Standing against peace. Envisioning a new Caliphate. Meet the moderate Al-Nahda party. "... the Umma cannot have existence in light of the Israeli occupation." Well, then, down with the Umma! I will never knowingly support Tunisia which is now controlled by the Muslim Brotherhood. Costco stores are selling food items from Tunisia including dates and other items.